I thought about titling this post I Did It! But that sounds a bit self congratulatory. 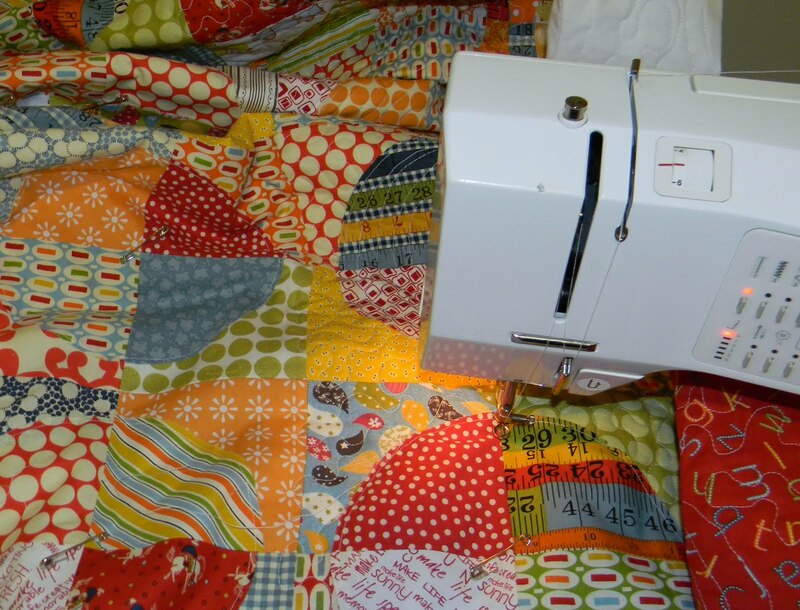 I am pleased, though, that I was able to tackle such a large quilt on my own and with free motion quilting no less. You saw how it dwarfed my little machine. 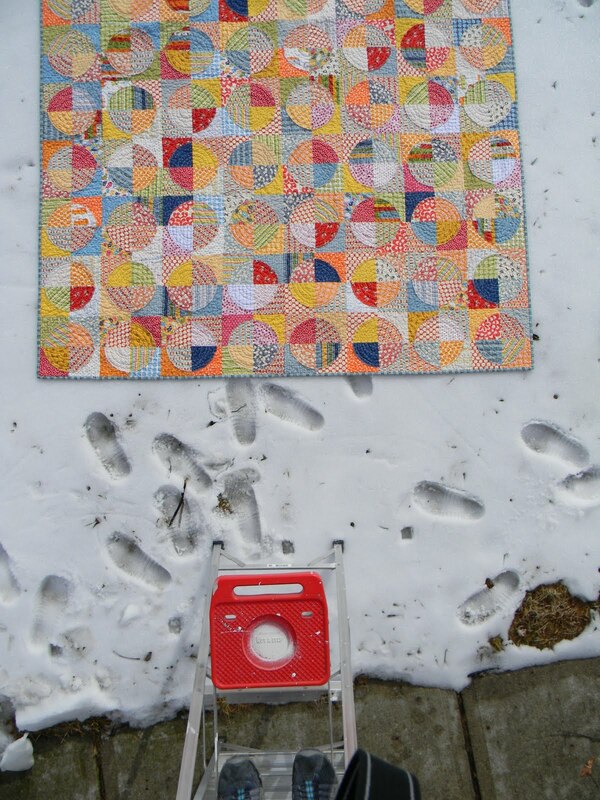 And here you can see the silly things we do to get a photo of such a big quilt. See my feet at the top of the ladder, oh and in the front yard? It ended up about 68" x 83" after washing and drying it. 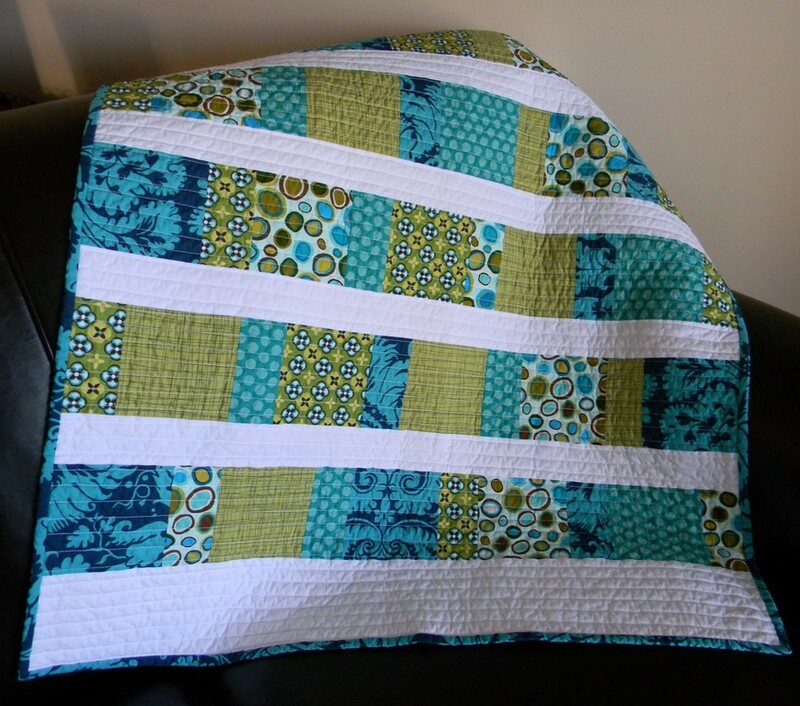 I bound the quilt in an American Jane rulers print. 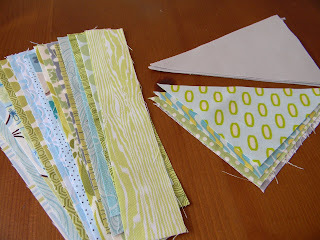 I made an extra bit of matching bunting for fun. 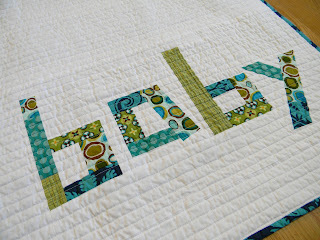 Here's the quilt on big brother's bed (still a crib for the guy who will get this quilt eventually). Improvised log cabins were the perfect use for scraps. 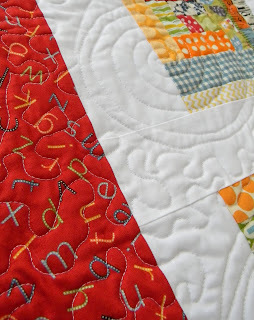 The red alphabet print on the back is from American Jane's Punctuation line. 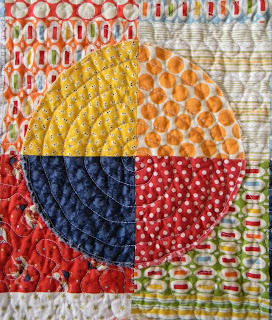 Here is a closeup of my swirly quilting. 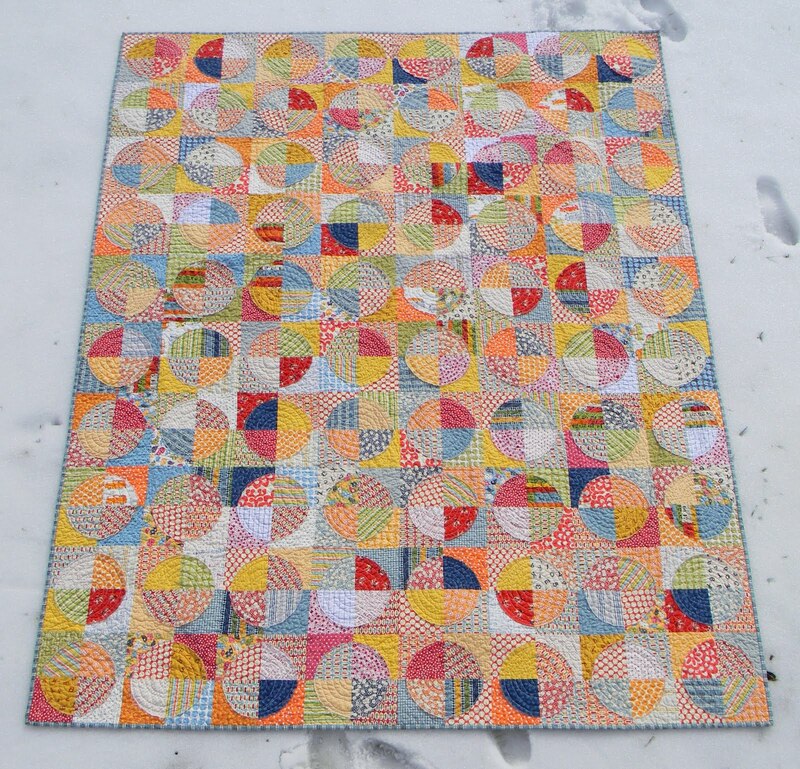 I almost quit after my first attempt because the free motion was wonky, and maneuvering the quilt under the needle on a quilt this size is exhausting. I'm glad I stuck it out. All the wobbles sort of disappear in a quilt this big and busy, and I definitely got better by the end. 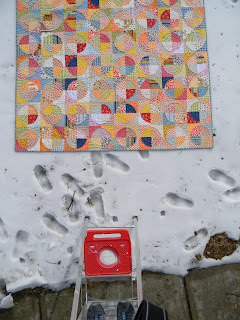 I'm really happy with the results, and this can be an example, in the future, of my "before" quilting! 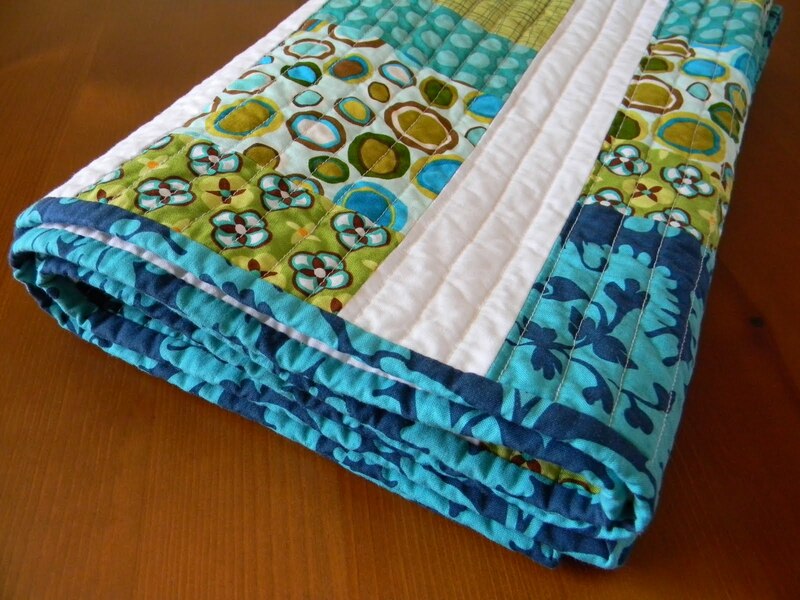 All that to say don't let big quilts intimidate you. Give it a go. 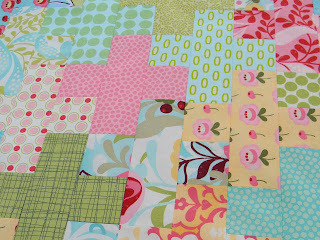 Although I enlarged the blocks, the original tutorial can be found here. 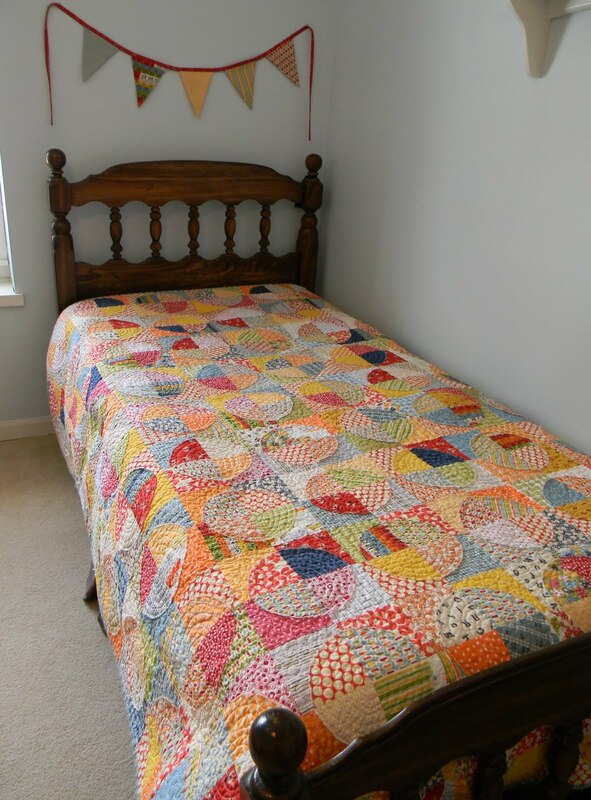 It's been a marathon of quilting the past week, but it's done. 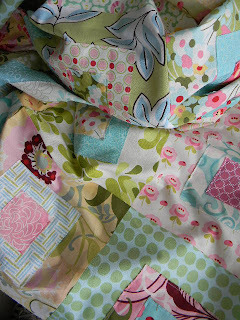 This is a sneak peek at the back of the quilt. 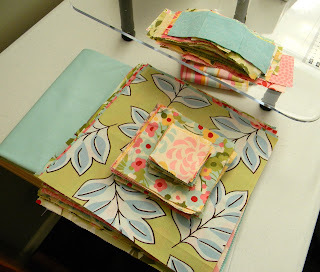 Now on to the marathon binding sessions. On another topic, thanks to Carla for the Liebster Award. Since it's so fun to find new, inspiring blogs, I'm going to nominate three more great crafty blogs with 300 or fewer followers. 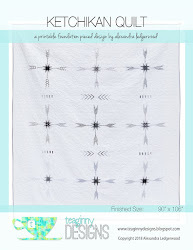 I've mentioned Krista's blog Spotted Stone a few times. She has impeccable taste and real design talent. 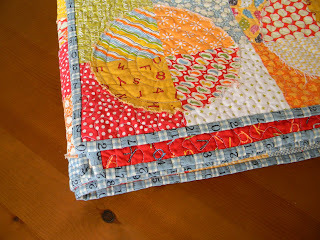 I also love reading Blue Elephant Stitches to see what new, lovely quilty creation she has come up with. 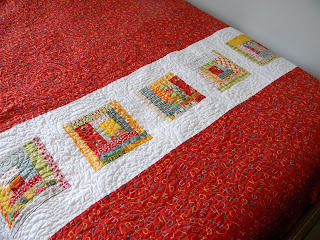 Finally, it only seems right to nominate Angela over at Quilting is my Therapy since today is her blog's one year anniversary. I'm not trying to influence my chances in winning her current giveaways at all. :) Seriously though, she is an amazingly talented artist. 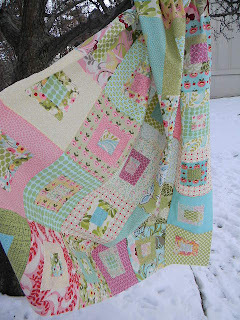 I am so lucky to have had two of my quilts quilted by her (I mean, she quilts all Tula Pink's quilts, for heaven's sake!). More like spring exploding with this riot of pattern. 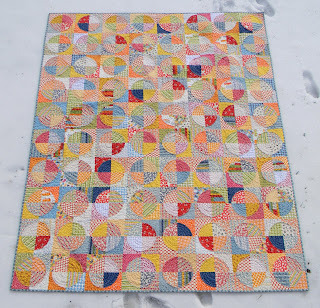 It is based on the Scruffily Quilt from Moda Bakeshop, designed by Rachel Griffin of ps i quilt. 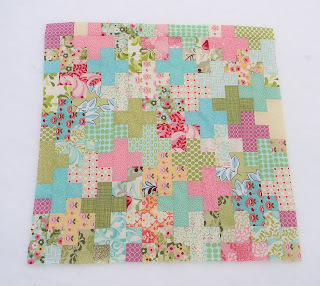 I added from my stash but used some of a Hunky Dory layercake, charm pack, and jellyroll. I also made it one row larger, so it's a nice couch quilt size. If you were to just use precuts it would be even speedier to piece. 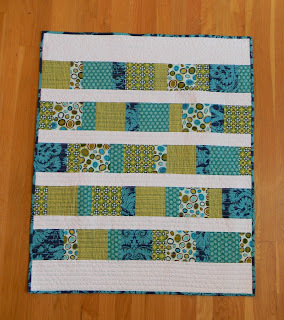 I'm looking forward to quilting it, but another quilt is first in line (and already using nearly all my basting pins). 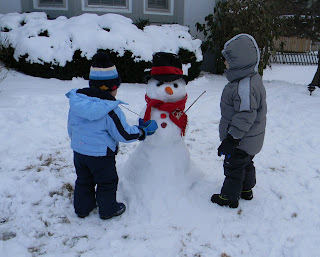 While we're out in the snow, here's the snowman kit I made in action. I'm feeling very inspired. 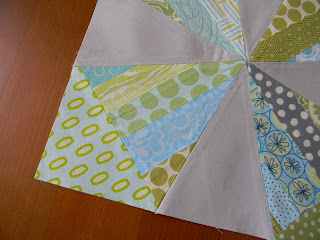 In fact, it's kind of a problem, given how little time I seem to have to devote to sewing. I'd certainly rather have too much than too little to inspire me though, right? These books were on my wish list for the holidays, and they do not disappoint! 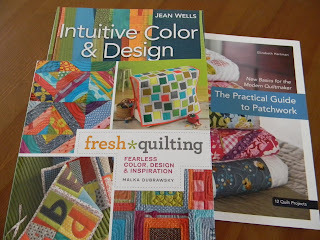 Malka's book in particular suits my improv leanings, and I'm excited to try some of the art quilt techniques in the book by Jean Wells (very soon, in fact, but more on that later). 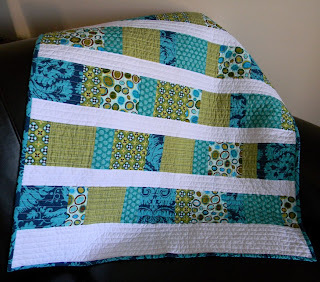 As you know I've already made two quilts from patterns by Elizabeth Hartman, and the instructions in the book seem just as impeccable as those I've encountered on her blog. 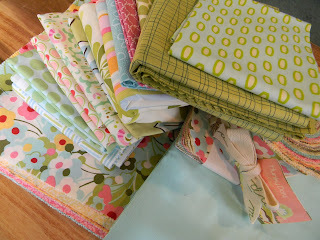 I found a quilter's candy land last weekend at Sarah's in Lawrence. I've been trying to find a time to visit for over 6 months and was afraid it couldn't live up to my built up anticipation. But it did - fabulous store with so many fabrics. 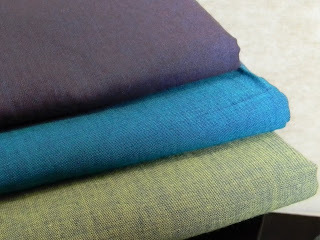 It is so fun to see fabrics I've admired online in person. When I asked if they had any shot cottons, they said "yes, we have all of them." Oh my! I came away with these three lovelies. If you haven't seen shot cottons, they are unique. 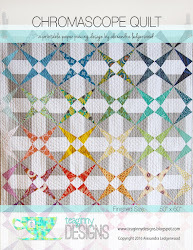 The warp and weft threads are different colors, which creates a shimmery depth to the colored fabric. So pretty. I'm planning to put all my inspiration to good use to tackle the latest KCMQG challenge. It' s called No Prints Allowed. 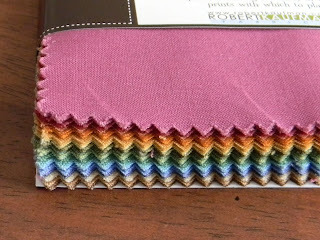 We're each to use a charm pack of Kona cotton solids (thank you to Robert Kaufman for donating them to the Guild!) 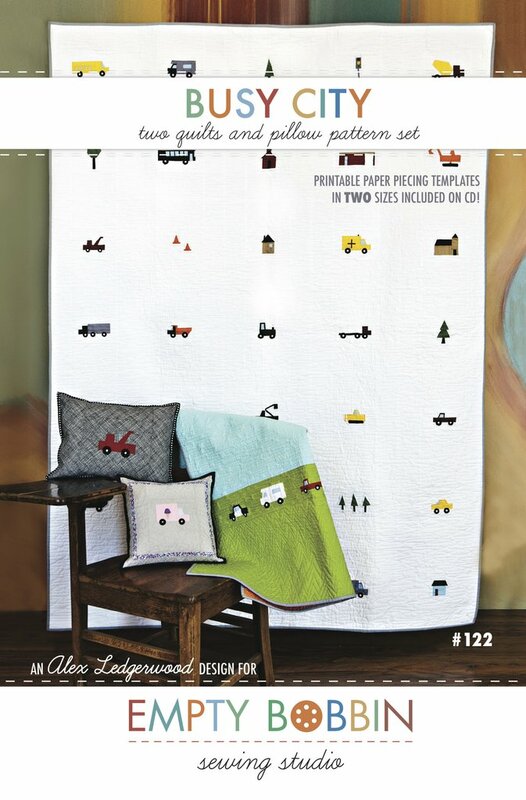 and make something quilty. 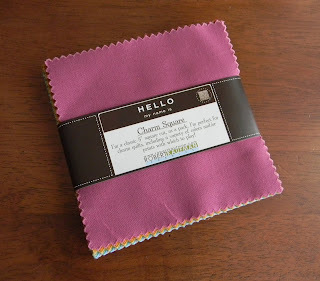 We can add other solids, but no printed fabrics and we must use a little bit of every fabric in the charm pack. I chose the dusty colorway, and I'm excited about my idea! 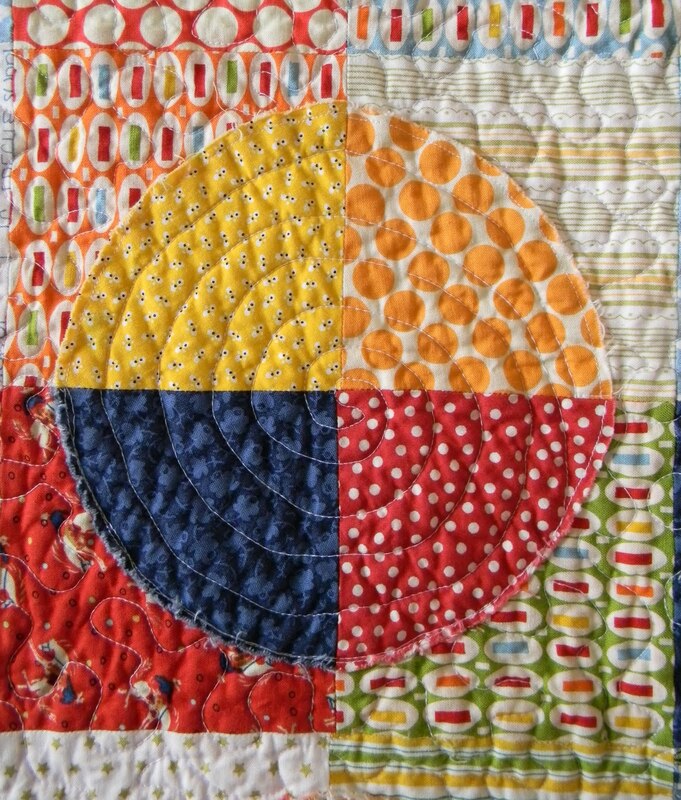 If you need a little inspiration this morning check out a quilt Jacquie shared with us last night at Guild meeting. It is amazing!! I am not from the Midwest. The winters here are brutal, in comparison to my southern homeland. Let's just say the gray, bitter cold gets me down. I also have two rambunctious little ones to keep entertained indoors for long periods of time. So, I'm pretending it's spring. 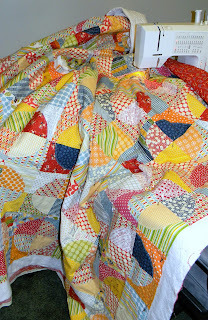 All cut up and ready to go for, not one, but two different quilts. 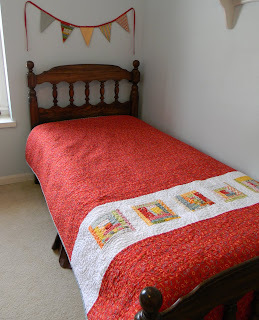 This quilt represents several firsts. 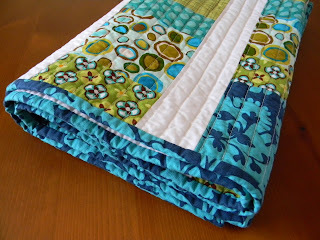 It is, obviously, the first quilt of 2011 for me, but it is also my first stash quilt. 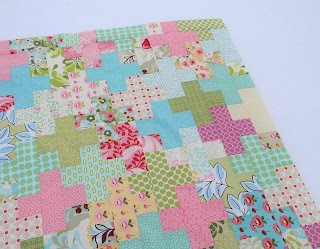 That's right, I did not buy any fabric to make this quilt! I think that justifies the closet of fabric I am amassing, right? Seriously though, it was very fun just to pull out my bins and put some things together to make this baby quilt. 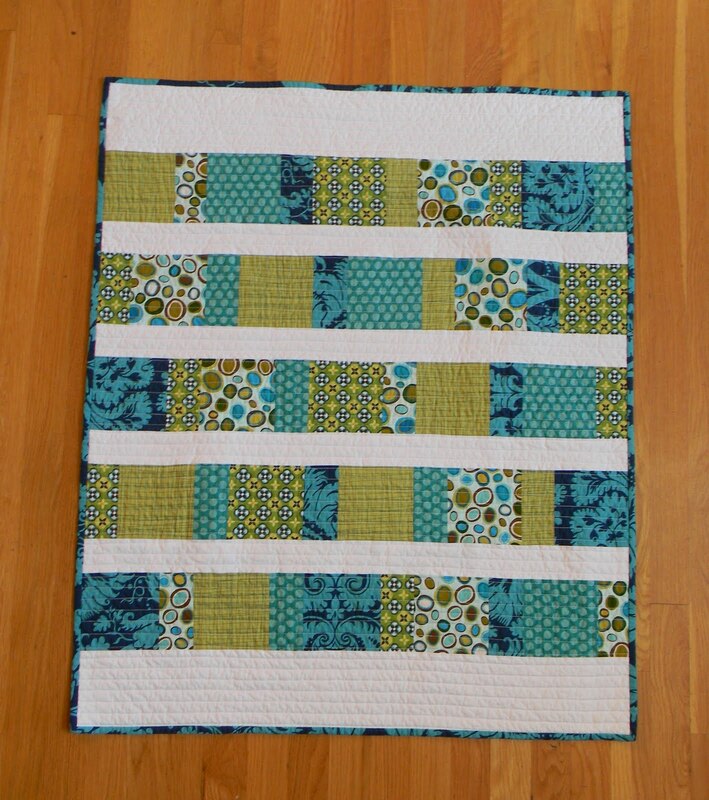 It was also my first time making Elizabeth Hartman's Charmed Squares Baby Quilt pattern. Super quick and easy, and I love the clean, modern look. 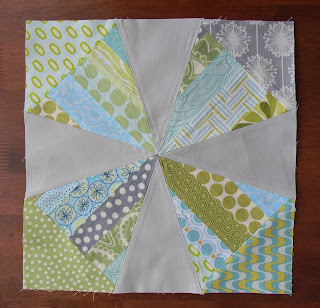 To make the quilt more unique, I pieced the back. 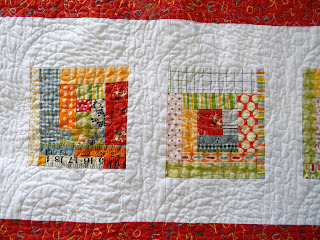 It is inspired by the improv word quilts popping up these days. I like that the back could also be the front. 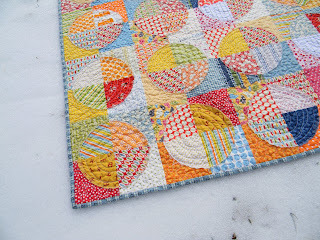 There are a mix of fabrics here: Amy Butler's Belle, Cosmo Cricket, Mezzanine, and two I'm not sure what. 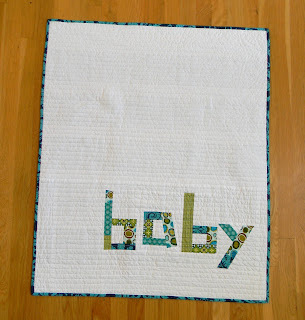 At 32 x 48 inches it is the perfect size for a baby, and I think the colors and fabrics would work equally well for a boy or girl. You can find this quilt in my shop.